Present your loved ones this Delicious Gourmet Appetizer Indian Dinner Gift Hamper and let them taste the real flavor of your love. 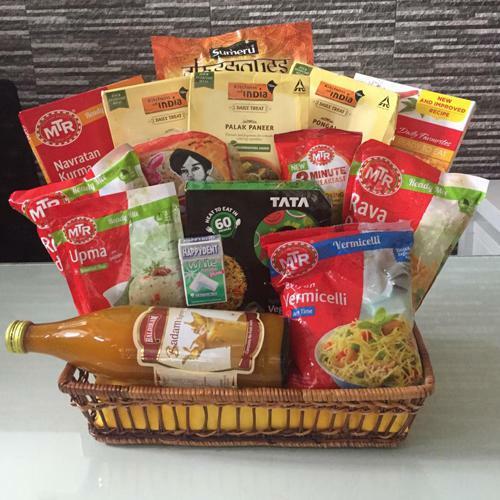 This fun-filled Hamper Basket filled with terrific treats such as 1 Carton MTR Ready To Eat- Mixed Vegetable Curry (Net Weight- 300 gr. ), 1 Carton Aashirvaad Ready Meals- Rajma Masala (Net Weight- 285 gr. ), Haldiram Badam Syrup, MTR Idli Mix, MTR Dosa Mix, 1 Pouch Sumeru Classiques- Flaky Paratha (Multi Layered) (4 Pcs. ), 1 Carton MTR Ready To Eat- Jeera Rice (Net Weight- 250 gr. ), 1 Carton MTR Ready To Eat- Palak Paneer (Net Weight- 300 gr. ), MTR Sambhar Rice Mix, MTR Pongal Mix, MTR Upma Mix, MTR Kesar Suji Halwa, MTR Vermicelli Mix, 1 Pouch Lijjat Papad- Punjabi Masala (Net Weight- 200 gr.) and Happy-dent Chewing Gum.